AdiIRC is a free client available for Windows and is well-known for being lightweight and supports portable mode. Download is available from adiirc.com and this howto is based on version 2.3. From the download link, there is 32 or 64-bit options, as well as portable mode for each – if you don’t know if you have 64-bit, then stick with the 32-bit. This just covers the basic adding of the server and authentication, there are plenty of options to explore though. The initial quick connect screen is handy, but not for our purposes. Check the “do not show again” box and close out of it. The second icon under File is the easiest way to get to the server list, and click on Add New Network. All kinds of good stuff here. 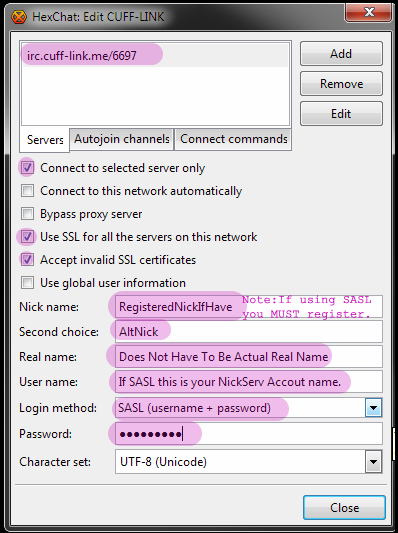 Fill in your nick, Username must be your Registered Nick, Password is the nickserv pass, Change Login Method to SASL (username+password). 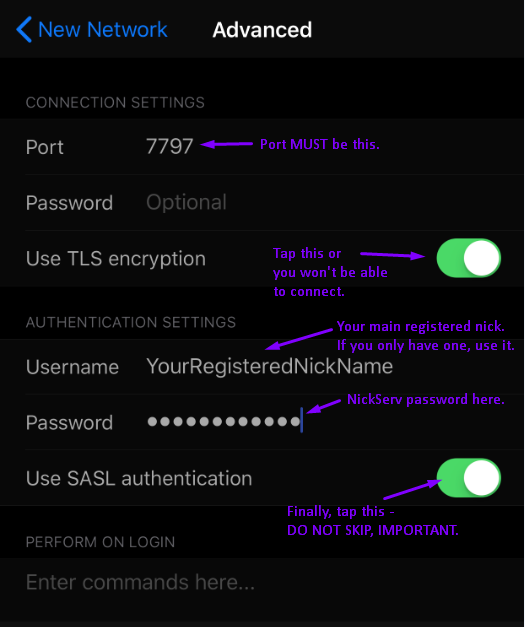 Optional recommended things are adding an alternate nick and setting connect on startup for ease of use. Click on the Servers tab at the top, then Add, and fill in: Hostname is irc.cuff-link.me, port 6697, Enable SSL, then click Save. That is all for the filling in! The Channels tab is optional if you already have favorite channels you want to set for autojoin. Click save at the bottom and then back to the General tab for Connect. There are some advanced features as well, such as authentication by SSL certificate and various different views. Explore the options!